Formartine’s debut in the Scottish Challenge Cup came to an abrupt end on Tuesday night when the we knocked out by Aberdeen U20s. The young Dons put five goals past United at North Lodge with the home side scoring twice in the last ten minutes to make the score more respectable. The deadlock was broken on the 27th minute when Aberdeen’s Dylan Thomas picked the pocket of Graeme Rodger near half way before running into space and threading a pass to Scott Wright who made easy work of the finish when one-on-one with Ewen MacDonald. Aberdeen were then rampant for a 15 minute period in the second half which started shortly after the break with a fantastic strike from Aaron Norris who found the top right corner of the net from 30 yards as MacDonald could only watch it fly in. Only four minutes later and it was 3-0, Scott Wright getting his second with a curling finish from a Frank Ross cut-back inside the box. Wright completed his hat-trick on 65 minutes when he weaved his way through the Formartine defence and round MacDonald to slot the ball home. The young winger will no doubt have done enough to impress the on-looking Derek McInnes and earn himself a place in the first team squad which will face Slovenian side Maribor on Thursday. 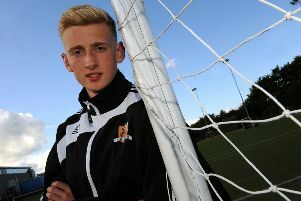 Barely over a minute later and former Man City youth striker Joe Nuttall rounded of the scoring for the young Dons when he curled in a shot from 12 yards after finding space inside the area. The introduction of Max Berton and Neil Gauld from the bench had breathed a bit of life into Formartine’s attack and the pair combined on 81 minutes as Gauld volleyed home Berton’s cross from 10 yards. Berton again played his part in United’s second just two minutes later as he delivered into the box and the Aberdeen defence failed to clear, Graeme Rodger capitalised on the goal-mouth scramble to stab the ball home from close range.